This giveaway is now closed. The winners have been notified via email. 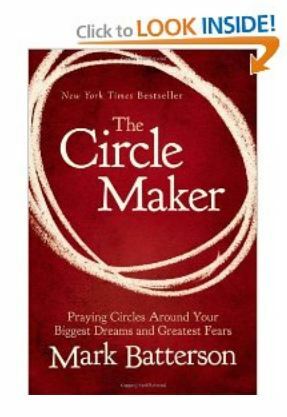 The Circle Maker: Praying Circles Around Your Biggest Dreams and Greatest Fears by Mark Batterson has made a huge impact in my life. I wrote my review and recommendation of The Circle Maker HERE, and I did my best to explain just how much I have learned from this wonderful book. I want you to have the opportunity to read it too, so we’re having a giveaway! Three prizes of ONE copy of The Circle Maker to three individual winners. Wow! Four winners in all! The giveaway begins today and runs through Tuesday at 11:59 pm CST. See all the details below. And in case you don’t win, please order these great resources! Remember, you can get FREE shipping when you order through Amazon Prime or Amazon Mom! Zondervan is offering one copy of The Circle Maker to three randomly selected winners, and one grand prize package of The Circle Maker, The Circle Maker Journal, and Praying Circles Around Your Children, to one randomly selected winner. The winners will be notified via email on Wednesday, February 13, 2013. Faithful Provisions Giveaway Disclosure: Zondervan sponsored this giveaway. For more information about Faithful Provisions, please read my Disclosure Policy. *One entry per person per method of entry per day. Be sure to enter a separate comment for each method of entry (one comment for Facebook, one comment for Twitter, etc.). This way you have a higher chance of winning. Please be sure that you leave an email address that you check daily, because that is how you will be notified if you are one of our winners. 1. COMMENT: Since The Circle Maker is about praying circles around your biggest dreams and greatest fears, leave a comment telling me one of your biggest dreams or greatest fears. 3. TWITTER: Follow Faithful Provisions and Zondervan on Twitter. 4. FACEBOOK: Follow Faithful Provisions and Zondervan on Facebook. GIVEAWAY ENDS Tuesday, February 12, 2013, at 11:59 pm CST. The winner will be drawn using Random.org. The winners will be notified via email on Wednesday, February 13, 2013. I have heard so much about this book and even have it on my wish list. My biggest dream is making enough in my businesses so that I can help ores to fulfill their dreams. I have always wanted to help and encourage others. Lots of dreams/ goals… Biggest fear – having bury another child…..
biggest dream: to build our own home. Our church is recommending this book and the journal. One of my greatest fears is having another child die…………. I like both Zondervan and Faithful Provisions on Facebook. My biggest dream is that my Nehemiah grows to be as strong the Nehemiah of the Old Testament. Biggest dream…that the will serve God and love others. I subscribe to your newsletter. Planning meals and prepping each week has changed our lives. Thank you for all you do. Would love to win. Reading “To be told” as well. Thanks for the contest! Subscribe via email. I’m signed up for the newsletter. My biggest fear is that I will become my mother. I follow on FB! Thanks! I need prayer circles around my daughter! My biggest fear——-anything concerning failure in her eyes! Oh my what a terrific book to give away. I would love to win it but if I don’t, I will certainly buy it. Biggest dream….to be a Godly wife and mother and that others will see Christ in me and that I would not be discouraged by the ways of this world! Biggest dream/fear is being able to raise my children in the Lord and trying to trust him that they will choose him! I think my biggest fear and dream are the same thing: raising my sons to become men who love and follow God with and their heart, soul, mind and strength. I follow Faithful Provisions and Zondervan on Twitter. I follow Faithful Provisions and Zondervan on Facebook. Biggest dream for me is empowering women, mentoring them where they are through spiritual and business opportunities, helping them to see they are so much more than they currently view themselves. I follow Zondervan and Faithful Provisions on Facebook. My biggest dream is to leave a spiritual legacy to my family, especially my sons; that they may grow to follow God in every aspect of their lives. My biggest dream is realizing God’s plan/purpose for my life. Biggest dream is to own a house with a yard in a close-knit community. I like FP and Zondervan on FB. Shared about the giveaway on Fb! Never finding someone who loves me for me.I recently ended a 10yr abusive relationship.Hurts so bad.Valentines Day doesn’t help much right now. One of my biggest fears is starting my own business to supplement our income. God has laid this before me and I try to work out all the logistics and all He wants me to do is take the first step! So scary! Biggest fear: Getting sick without health insurance. Biggest fear is not being able to support my family. My biggest dream is to watch my husband and kids grow in Christ individually and as a family. This has been a year of change for our family. We’ve gone down a new path and have stumble along the way, but with God’s grace and mercy and forgiveness we continue on. I also also subscribe to your newsletter…and love it! Thnx!!! My big dream is being a nurse. I am getting too old to pursue it now though. My biggest dream is for my two special needs children will continue to grow, mature, develop skills, have friends, and be able to live in some form of independence. One of my greatest dreams is to write and teach! Write and write and write. The biggest dream my wife and I share is to finally have a baby after years of struggling. I am a subscriber, Twitter and Facebook follower! Biggest dream is to build a home where people in need can stay temporarily. Greatest fear is for my son deployed in Afghanistan. I am a long time subscriber to Faithful Provisions. I “like” Faithful Provisions on Facebook and will “like” Zondervan on Facebooke! Already a subscriber and a huge fan! Biggest dream is to serve in missions alongside my husband. Praying for God’s direction! One of my biggest dreams is for my travel agency to become more successful each month. This sounds amazing! I would love to strengthen my prayer life — I think one of my biggest fears right now is not praying enough over my kids and just not knowing what TO pray… I don’t like feeling like I’m repeating the same thing over and over and I don’t want it to be useless! 🙂 Thank you for even posting about this book, sounds amazing! I get your newsletter daily — love it!! One of my biggest dreams is to write songs, children’s books, and to paint nature scenes. I have made baby steps toward these goals but I dream about following these creative urges more fully. I am already a newsletter subsciber. I get your emails daily. one of my biggest dreams is that my sweet los will have God at the center of their lives! I liked you and Zondervan on Facebook. My greatest fear is that my daughter continues her pursuit of a wild and dangerous lifestye. Day two of Tweeting, I posted on my FB wall, I follow you and Zondervan, and I am a newsletter subscriber. I am in constant prayer that this housing deal we are in goes through. I love being a facebook fan of yours! I have been a twitter fan for a while now. My biggest dream right now is to be able to look back in 20+ years and be happy with how I raised my children! 🙂 Thanks for having this contest, the book looks great! Biggest fear: Losing my health and not being able to support my family. Fear: Losing my health and not having health insurance.